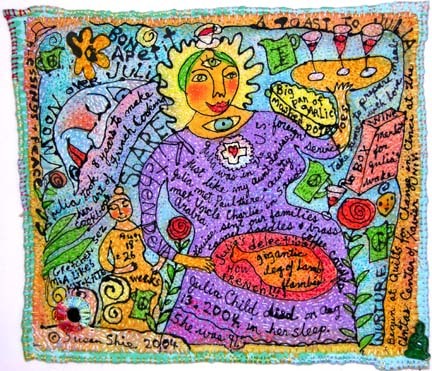 11-30-05 Turtle Trax Diary.Outsider Art quilts,paintings.Art Classes.Monthly Adult Art Class Workshops, airpen, fabric painting.Susan Shie.Turtle Moon Studios. 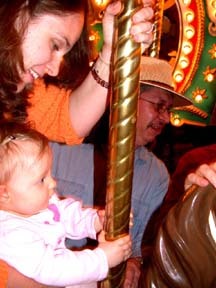 At left are my daughter Gretchen and her daughter Eva on the Merry-Go-Round at the Wayne County Fair in September. 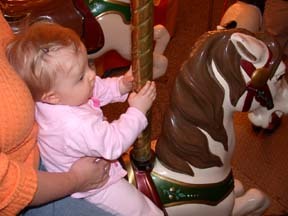 This was Eva's first Merry-Go-Round ride. I love seeing her "firsts." 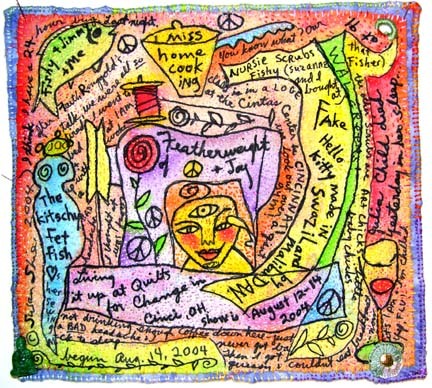 Topics in this diary: Lots of artwork, including: "Kitschy Fet Fish"; "Ode to Julia Child"; "Quilts for Change 06 raffle quilt and poster image"; "Katrina Blues"; "Higher Ground"; "Old Bags for Peace"; "Peace Brew for Jimmy"; "Rainforest Goddess"; "Sally Green's Aquarius Blessings"; "Wilma (Peace Voodoo); "Love Birds"; and "Studio Blessings"; as well as these events: Quilts for Change, the event; the Fair; my birthday; Eva's first birthday; The Box Show; Thanksgiving; Jimmy's birthday; and our Autumn trip to Mohican. The rest of this Summer seemed to go by in a big whirl. That's why I'm calling this diary Autumn. I can't believe it's December already! Yikes! Well, I'm making this diary in pieces, and it's going to be up late, but we'll all just have to get over that. Granny Nannies move kinda slowly these days! And they need more sleep than they thought they did. Ha! I think this may be my last great big diary. I want to get back to shorter diaries. And I feel I really need to start paying a lot more attention to my galleries on this site. 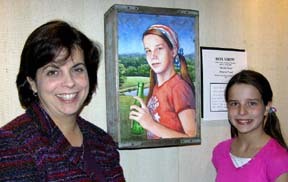 I hope to make my 2005 Gallery inclusive of all the work I've done this year, but don't know how soon that'll be done. I guess I'll start adding to it right after I get this honker of a diary done! Right now all that's there are the four new Studio Blessings paintings I have for sale. This is a piece I started at Quilts for Change in Cincinnati, in a class I was teaching there last August. I started so many art pieces as class demos, and then had to move on to the next class demo, creating tons of unfinished art quilts. In my classes from the last three years alone, I think I started at least 30 pieces, small to large in size, that I've been finally getting a chance to revisit to finish this year. At least a few of them! This one is called "Kitschy Fet Fish" and is named after the funky blue figure on the left side of the little piece. (It's only 10"h x 11"w, and is for sale at $1,650.) Suzanne Fisher, who's a very accomplished mixed media artist in Cincinnati and a good friend of mine, assisted me in my classes at Quilts for Change, out of the goodness of her heart! She had a small glass goddess pendant made by her friend Caitlin Hyde, and that's what the Fet Fish is! Well, that's what we named it. It's really an amazingly detailed flameworked female figure, so graceful! Caitlin is a really gifted artist and later came to our Turtle Art Camp to study last fall, and she gave me my own Fet Fish! Oh yeah, Suzanne and I had a big time buying and wearing matching nurse's scrubs for our teaching together, and the funky Hello Kitty scrubs are in this little piece, too. Anyhow, I finally finished this one this Summer. Yea! One down! Lots of hand stitching over the painting. Also begun in my Quilts for Change classes last year, "Ode to Julia Chiild" (9.5"h x 11"w, $1,650.) was started the day after Julia died. I finished it this Summer, and it's been accepted into Fine Focus '06, the fourth in their series of touring shows of small works. In both this piece and the one above it, I would sew by hand on them while Eva was sleeping. Slowly things get done! A little here, a little more there! 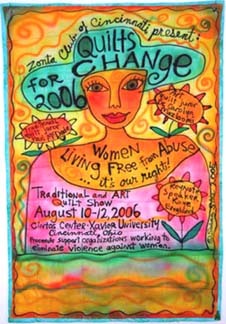 By the way, Quilts for Change is happening again for 2006, on August 10 - 12, again at the Cintas Center of Xavier University in Cincinnati. The exhibition entry deadline is April 3, 2006, and the entry fee is only $10. I'm not one of the jurors or instructors this time, but will be entering a group piece with my tArts friends here in Cleveland. If we get our piece accepted, we're all going down to the opening. There will be some great classes, besides the huge exhibition of art quilts and traditional quilts, and a super vendor mall. All the money raised goes to assisting places like women's shelters. The theme is "Women Living Free from Abuse: It's Our Right." (same theme as in 2004.) the Zonta Club of Cincinnati puts on Quilts for Change, and they are wonderful and tireless! I made a painting to raffle off for the 2004 QFC, and this time I made a whole quilt, shown here. The raffle info is on the site now. My work is used as the image on the poster, postcard, tee-shirt, dress pin, and tote bag for the show, so I am very happy about all that! And the sales profits from all those goodies and the raffle money all go to helping abused women. As I said, the women of the Zonta Club are super wonderful people! "Katrina Blues" is the final name I gave to the big quilt I started as "Panny Nanny Blues." I was making it for our WAGE show that opens in early Feb in Wooster, "The Blues." So all the colors are very bluesy and cool, except for those red stink pots and lips! I had all the images drawn and painted in, and then Hurricane Katrina hit the Gulf Coast, and as I started to do my diary writing, more and more news of and my commentary on Katrina came naturally into my writing. Eventually I realized that, even though the pictures were of my life, the writing was more social and political in theme. So her name changed. "Katrina" is 45"h and 75.5"w, painted with fabric paint with regular brushes and my airpen (for the lines). She is mostly machine stitched in my "crazy grids" style, in which I don't measure, and just make a ton of horizontal and vertical lines that get kinda wavy at times. I finished her on September 11th. 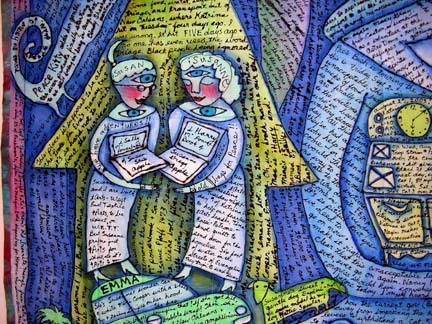 This is a detail of "Katrina Blues, showing me in Cleveland with my friend Susanne Gregg and our matching Macintosh laptops, Harry and Sally (hers and mine),standing on her Mini Cooper named Emma. It's hard to stomach the fact that now it's three months since Katrina hit, and the blatant bungling that went on in the rescue and recovery from thisstorm has not improved. So many people remain suffering, while all the money goes into the war and tax cuts for the super rich. I have been signing a lot of petitions for MoveOn.org, but my biggest way of protesting has become through my art. I guess if all of us who hate how this country is going will please stand up and say what we believe, to as many people as we can, then things might change. Otherwise, if we're too afraid to protest, we might as well admit we're not living in a democracy anymore. Hitler shamed and punished his detractors, too. Is that what we've come to???? 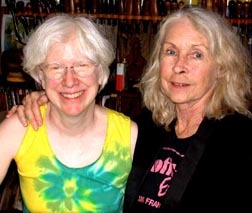 Back off my soapbox, here is my birthday sister Jane Bates with me, on our birthday this year. We are both Tigers, besides sharing our Libra birthday. I used this picture instead of the one where I put a pink tiara on Queen Jane and gave her a pink star scepter. I don't think she was really into it. Musta been the pink! Next time I'll try for something more elegant! Eva's birthday was Oct 22, the last day of Libra. Gretchen and Mike threw her a great party, and she was very full of fun and seemed to really delight in having all her guests over. 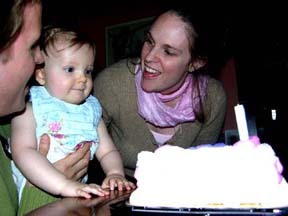 Here's her cake before they blew out the candle. 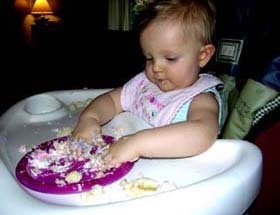 And here's her piece of cake, after Eva thoughtfully, very quietly and slowly, mashed it into tiny pieces. I see a born potter there, enjoying that interesting texture. She didn't throw it around or smear it into her hair. Just worked it to a pulp! Talk show hostess? Could be! Actually, this is the first picture I took when we got to Eva's party. I had been worried that she'd be all freaked and crying, due to having so many people there. She's been afraid of tall men and strangers. 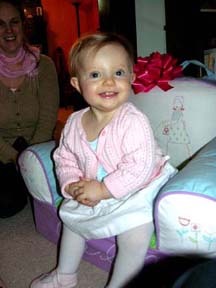 But there she was, happy as a little clam in her brand new Birthday Chair! And she stayed that happy! 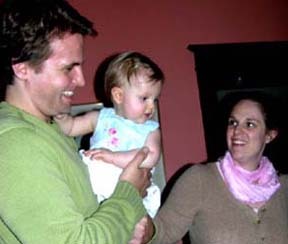 You can just see how much Michael and Gretchen adore their little Eva. And we all do, too! This was over a month ago, and my, Eva has really grown and gained skills since then. Now she has a tiny vocabulary of words that actually go with what she's talking about... CAT and APPLE, mostly. She's started to wave at us. 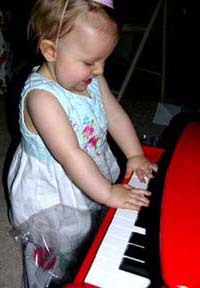 She began walking early, around 11 months, and now is working on Moon Walking. Honest. 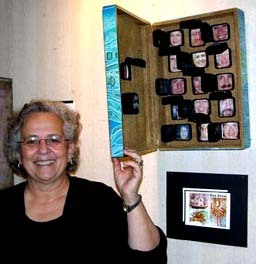 Jann Gallagher, a member of WAGE, our local artists support group (Wayne Artists Group Effort) curated a wonderful exhibition called The Box Show at Lowry Center at The College of Wooster. It was up from October 16 to 30, 2005, and here are some pix of the show, but not nearly all the artists or their works are shown here. I think there were 17 artists and maybe 21 box pieces. Jann's prospectus simply said that the work had to be an actual box and that it had to hang on the wall. Above is one of the three or four (!) pieces Jann herself made for the show. It's the show's sign, and is great! 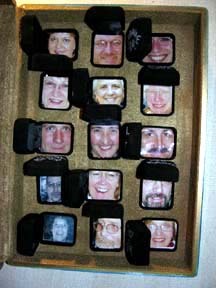 She took closeup pix of us all, without saying why, at one of our WAGE meetings, then put an image of each of our faces inside a black velvet ring box. Our names are written by Jann on the lids, which you can flip down, in the finished piece. Two more artist-portrait boxes are in the lid of this silverware box, which holds all the little boxes. I think this piece is brilliant! 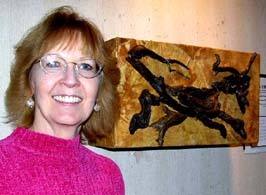 Here is Lorene Meier (aka Renie, Rene, ReVerne, LaVerne...) with one of her two pieces in The Box Show, called "Woods Monster. " Rene lives in a very pretty woods, and I think this Woods Monster is really one of the many baby kittens she's got running around her place right now! 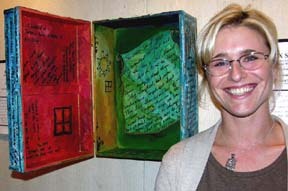 Here's Stephanie Pevec with her piece in The Box Show. 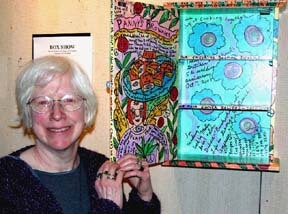 Here's WAGE member Margaret Freed with "The Real Thing," her piece in The Box Show, as well as the model for her piece, her oldest daughter Margaret. I made "Recipes for Fine Living (Vote DEM)" for The Box Show. 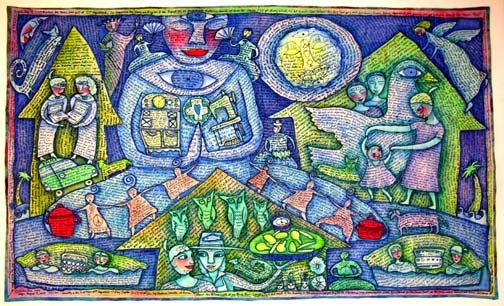 It was one of those pieces I'd begun a while back, actually in 2003, I think. Maybe 2002??? At the last class Jimmy and I taught at Garaway Schools' ArtsWeek in Sugarcreek, OH, for our Painted Furniture class. Renie was with me when I found the little cupboard, so it already had a WAGE connection from the start. I added a lot more writing to the partly made piece, to finish it for The Box Show. The front has Julia Child and me, and the back is Jimmy making some burritos. Sides, top, bottom, and insides, including the shelves, are all painted and written on. That's my mom and her famous Panny's Brownies on the inside of the door. Now if I just had room in my kitchen to hang it on the wall there! Go to Page Two of this diary. This page updated by Susan Shie, December 3, 2005.